Why stay in Montessori for Kindergarten? 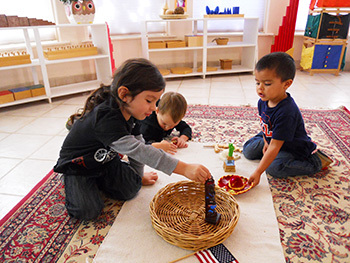 Montessori education is based upon two powerful, unique ideas that are supported by 100 years of academic excellence and current scientific research. 2. The school is a scientifically prepared environment. At the turn of the last century, 100 years ago, education was based on the factory model. Children were considered empty vessels into which knowledge was pumped, assembly line style. In fact, many traditional educational models are still this way. Teachers at public schools must teach to the test and standards, not to the child. A little more than 100 years ago Maria Montessori was the first woman to become a physician in Italy. Within ten years she started a children’s school in one of the poorest sections of Rome. Her first class had sixty children and one woman she recruited to supervise them, who was not trained as a teacher. Dr. Montessori spent her time there observing the children and developing materials. You can see why we love to have children start at our school when they are two or three, rather than waiting until they are four, because of the timing of some of these sensitive periods. Children learn on their own, from their inner need to develop their capacities. Teachers assist the children by preparing the environment with materials that correspond to the children’s sensitive periods. In Montessori schools, teachers recognize that children learn best under the following conditions. Children are allowed independence, and are given opportunities for concentration. They have free choice, and rewards and punishments for intellectual work are not used. However, children must respect the materials and their classmates. The materials are designed so the children have success at each small level and are gradually prepared for the next more difficult task. 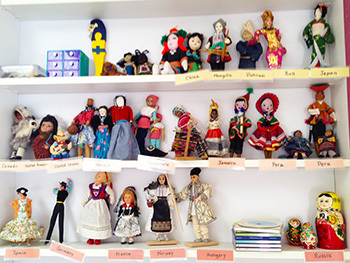 The five areas in the classroom are Practical Life, Sensorial, Math, Language and Cultural. Cultural includes on art, music, science, history, and geography. Practical Life gives the children familiar activities that are child-sized real work. It includes activities like washing hands, pouring water, sweeping, dusting shelves, watering plants, and washing dishes. A casual observer may think we are training children to be housekeepers, but actually the Practical Life activities are the foundation for everything else in the classroom. The children learn concentration, coordination, order and the work cycle in Practical Life. That is how to get a work out, do the work and put the work away. 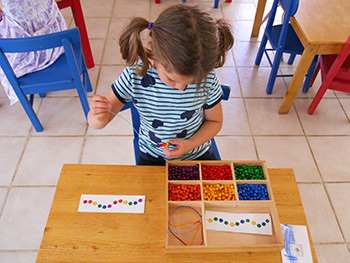 This ability to concentrate and follow a work cycle is what differentiates a Montessori school child from the rest. Educational research has documented that Montessori schools foster concentration, confidence and independence in children. The sensorial materials are unique materials designed by Montessori to isolate one sensory quality at a time. When the sensory inputs are organized, the child’s brain becomes organized. 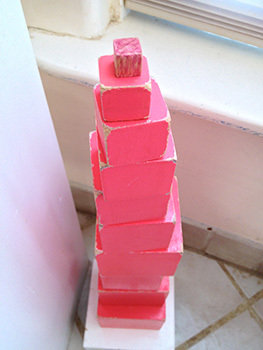 This example is the pink tower, which changes in only one aspect, size. The color and the shape and the texture all remain the same. 1. Order in the environment is beneficial to children. 2. Learning and well-being are improved when people have a sense of control over their lives. In our classrooms, children chose what and when and where they will work. And with whom, most of the time. Children have freedom to choose their work within the limits of respecting the other children and materials in the classroom. 4. Current research shows an inverse relationship between external rewards and motivation. – Montessori observed that the use of rewards and punishments made no impact in the children’s behavior. 5. People learn better when they are interested in what they are learning. We follow the child’s lead and present lessons when they demonstrate an interest. 6. Our adult interaction style positively affects child outcomes. Montessori instructed her teachers to be warm and loving, but authoritative, which research shows to have positive outcomes. 7. Collaborative peer learning is effective. Our preschool class is for 3 to 6 year olds. The older children are role models and teachers for the younger children, and the younger children look up to the older children. Each year they are here the children have a different social role to fill. Cognitively, their roles change as well. The three year old is at a sensorial acquisition stage. The four year old is refining those sensorial impressions. The five and six year olds are moving to a slightly more abstract level of thinking, and build those abstractions on the previous sensorial inputs. If your child is only here for one or two years, he or she misses out on some of these experiences. Our educational program is much richer than simply “socializing” or preparing your child for elementary school. Educational research has documented that Montessori schools foster concentration, confidence and independence in children. The upper grade teachers at El Dorado Elementary have commented that they can tell which children came from Montessori; they are the children who are most excited about learning. Sign up to receive email announcements about activities, holidays, events, school closures and more.